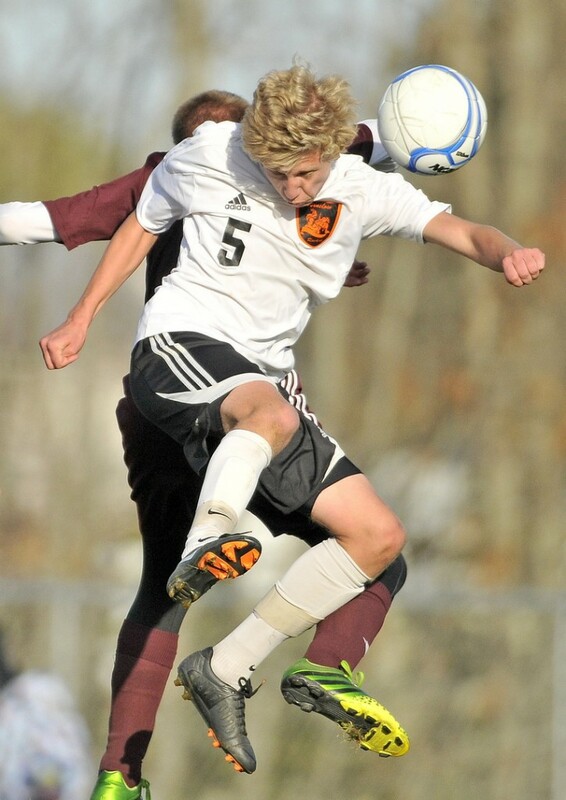 WINSLOW — The Winslow boys soccer team was a little out of sync, a little jittery and, worst of all, trailing 1-0 just eight minutes into its Eastern B quarterfinal game Wednesday against Foxcroft. It was, coach Aaron Wolfe said, not exactly how the No. 3 Raiders hoped to start playoffs. Sophomore forward Jimmy Fowler provided it, scoring two goals later in the half to send Winslow (12-0-3) into the regional semifinals with a gritty 2-1 victory at Kennebec Savings Bank Field. Winslow will play at No. 2 Camden Hills (14-0-1) at 1 p.m. Saturday. The Ponies and Raiders were tied 1-1 when Fowler scored the eventual game-winning goal with about 12 minutes left in the first half. No. 11 Foxcroft, which defeated Oceanside in a prelim game, finished 7-8-1. Wolfe said the Ponies were the better team early. Julian Zepeda gave the Ponies a 1-0 lead when he beat Winslow keeper Alex Berard about seven minutes into the game. Fowler tied it midway through the half when he headed a pass from Cody Doughty over Foxcroft goalie Logan Butera. Fowler scored his second of the game a few minutes later when he redirected a shot past Butera. The teams traded scoring chances in the second half but the Ponies couldn’t get the equalizer.